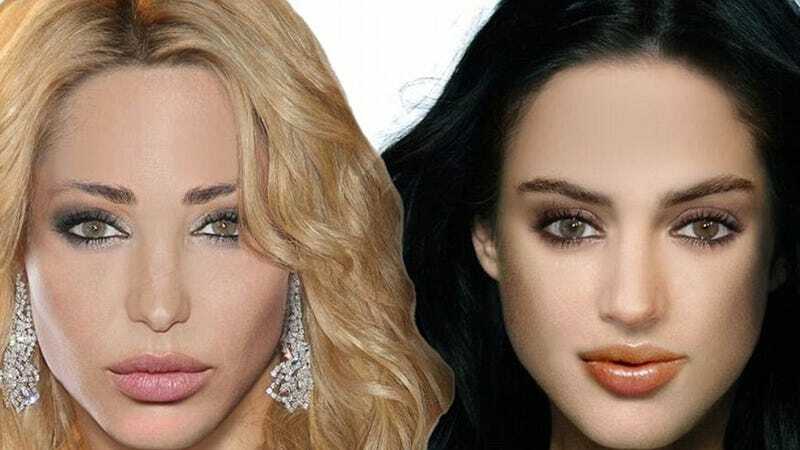 According to a survey commissioned by cosmetics and body care retailer Escentual.com, these are the faces of ultimate womanly beauty—the left described by men and the right, by women. The survey asked users to pick and choose their favorite features from celebrities (the same process utilized by the Greek god Hephaestus when forging the ravishing yet deadly Pandora), and slapped those results together to create not one, but two Franken-beauties. While there certainly are striking differences between the men's and women's image, I think it's safe to say that both of these images are equally creepy. It could be the unfinished photoshop job, the abrupt hair, or the inexplicable diamond earrings on the blonde, but both make-believe ladies look ready to be copy and pasted onto the business cards of a nightclub owner who wears a thin chain on the outside of his iridescent button up. Of course, if I could take this ridiculous beauty farce seriously, I'd finding it more troubling that both images are of white women with largely white facial features. In fact, of the 13 celebrities that comprise the images, the only non-white features represented are hair (from Freida Pinto and Shakira). HAIR. While these images bring up some alarming ideas about our narrow beauty standards, if anything, they're simply a testament to the unsettling hilarity and chaos that ensues when you try to create the ideal woman by mod-podging the faces of top celebrities.